RESEARCH TRIANGLE PARK, NC--(Marketwired - April 07, 2016) - Pharmaceutical and medical device teams plan to increasingly involve contract research organizations (CROs) in their clinical trial planning processes. 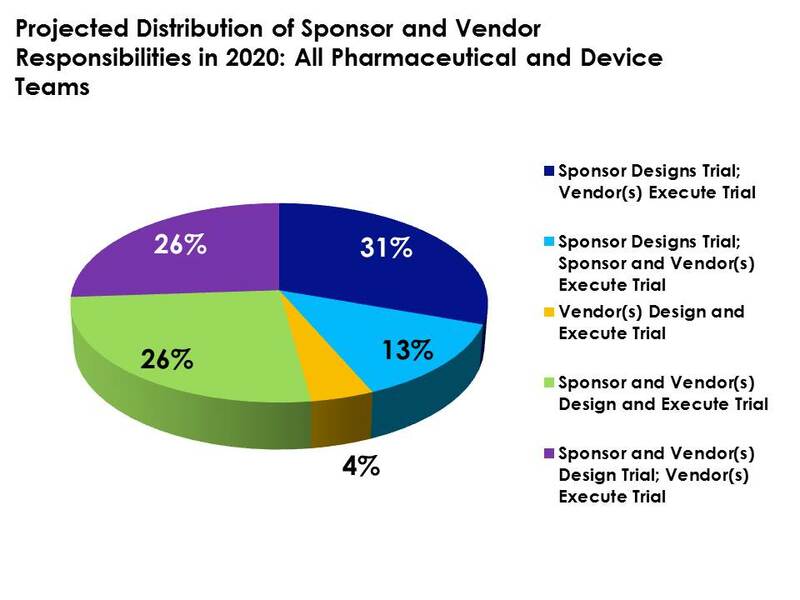 The largest projected change is the level of vendor involvement in trial design activities, according to a recent report issued by pharmaceutical intelligence provider Cutting Edge Information. Surveyed companies report that they currently share strategic planning duties with vendors at 17 percent of organizations. By 2020, the number of teams planning to share these trial design responsibilities with CROs is expected to increase to 52 percent. "Projected changes to sponsor-CRO working relationships owe largely to shifts within large and mid-sized pharma companies," said Sarah Ray, senior analyst at Cutting Edge Information. "In 2014, no surveyed Top 10 or Top 50 team reported sharing trial design responsibilities with CROs or other third parties. This is drastically changing, however, as half of these surveyed teams plan to involve vendors in the clinical trial design process within the next three to five years." Changes to other surveyed team types are more varied. Like surveyed large pharmaceutical organizations, device teams also report plans to increase vendor involvement in their clinical trial design activities. In 2014, all surveyed device teams retained trial planning responsibilities exclusively in-house. However, an estimated quarter of surveyed device teams plan to share trial design duties with CROs in the future. Metrics detailing clinical trial activities from pharmaceutical, device, CRO and site perspectives. Data on surveyed teams' vendor selection process and preferred collaboration type (master services agreement versus functional service provider). Best practice recommendations and projected costs associated with selected patient recruitment activities. Profiles of 17 pharmaceutical, biotech, device and CRO-managed clinical trials, including overall trial costs, number of enrolled patients and sites and clinical team size. For more information about clinical outsourcing practices, please visit http://www.cuttingedgeinfo.com/research/clinical-development/outsourcing-selection-strategy/. Surveyed companies report that they currently share strategic planning duties with vendors at 17 percent of organizations, according to primary intelligence firm Cutting Edge Information. By 2020, the number of teams planning to share these trial design responsibilities with CROs is expected to increase to 52 percent.